In the past few years, I have gradually grown a distaste for how some businesses are run in the new millennium. In particular, the lack of accountability and solid standards frustrates me: I want to be in sync with my superiors on precisely what my output is expected to be so that neither of us is surprised when evaluation time comes. 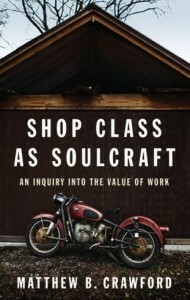 I was pleasantly surprised, then, by how well Shop Class as Soulcraft has sold. It examines the psychological and social contexts involved in the author’s choice to leave his doctorate-bearing knowledge worker job to return to being a mechanic. At the heart of the first part of the book is education – in particular, learning by doing. I feel like this has been a big part of what I have enjoyed in my education – at first, learning about computers by breaking them, then my time at Summit Tech, and my time in the Raikes School. One thing I’ve learned in Design Studio is that there is more to a successful project than meeting the listed requirements: there are implicit expectations about the internal quality of the delivered product. This doesn’t, however, mean that success is immeasurable. These two notions of craftsmanship and the ability to objectively evaluate success are explored in the first few pages of the book. ‘Scientific management’ is also examined as the force behind the replacement of thought and autonomy with process. The replaceability of labor in such a system is both its benefit and drawback: while it drastically cuts costs of labor, the employee is now a commodity burdened with anxiety. That anxiety is increased by the societal promotion of debtedness as normal and desirable. Marketing messages are based on the idea that to solve a problem, we must buy the new rather than fix (or accept) the old. I see authors’ reluctance to include extensive personal experience in non-fiction books as a flaw. For that reason, this book was brilliant for me: the story and the facts are mixed in a way that is congruent enough to follow, but not so homogenous that it’s boring. I strongly recommend it to anyone who plans to work for someone, or have someone work for them, at some point in the remainder of their life – hopefully, everyone who reads this.